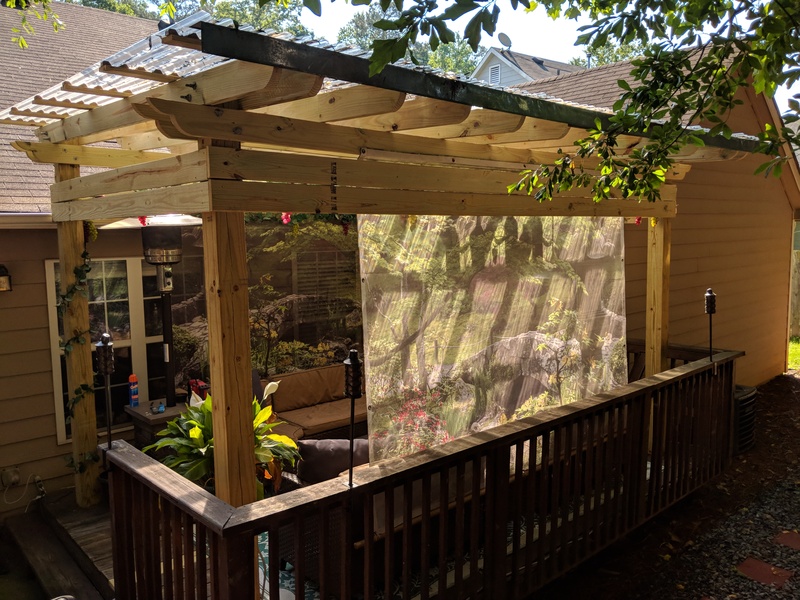 With so many benefits to a pleasant outdoor space of your own, a pergola is a wonderful and economic structure to introduce into and expand your living space. As a lovely centerpiece or an eye-catching addition to your yard, it lends the perfect backdrop while entertaining friends and family: everything from a charming casual backyard barbeque to an elegant summer evening of dinner and drinks al fresco. Not to mention, of course, providing an entrancing refuge for the simple, quiet joy of some well-deserved me-time. Especially now, with spring just a flowery breath away and summer dancing so close behind. Not to forget, there’s autumn’s spectacularly colorful array to enjoy later in the year! 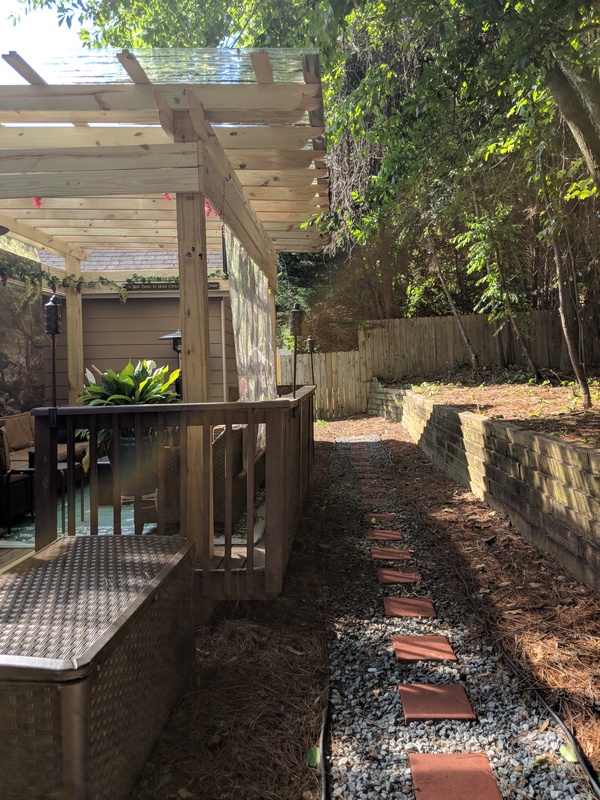 A pergola is a cost-effective, time-friendly and fantastic way to supplement the welcoming ambience of a peaceful and beautiful outdoor retreat just beyond your door. 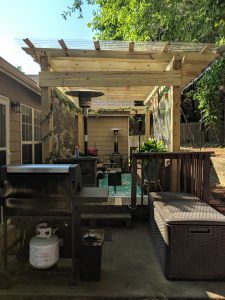 Keith Kelchner, founder and CEO of 2HIRE.US, and his wife, Kat, decided to build a pergola after moving to their new home. Having enjoyed one at their previous residence, it was a simple choice to build another and continue all the outdoor fun! After a little bit of online research, they landed on a design they loved and happily went ahead with the project. Taking only two and a half days, with one crew consisting of two crew-members, it cost a comfortable $3,900 for the actual structure (which included labor and materials). After additional landscaping and décor, they’re positively thrilled with the results. 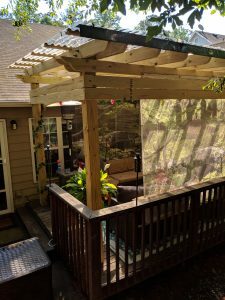 However, it is important to keep in mind that the cost of building a pergola is influenced by many different variables, all of which can cause the final price to fluctuate. 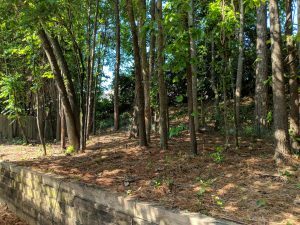 So, what were some of the considerations Keith and Kat weighed as they moved forward, and what factors contributed to their decisions? 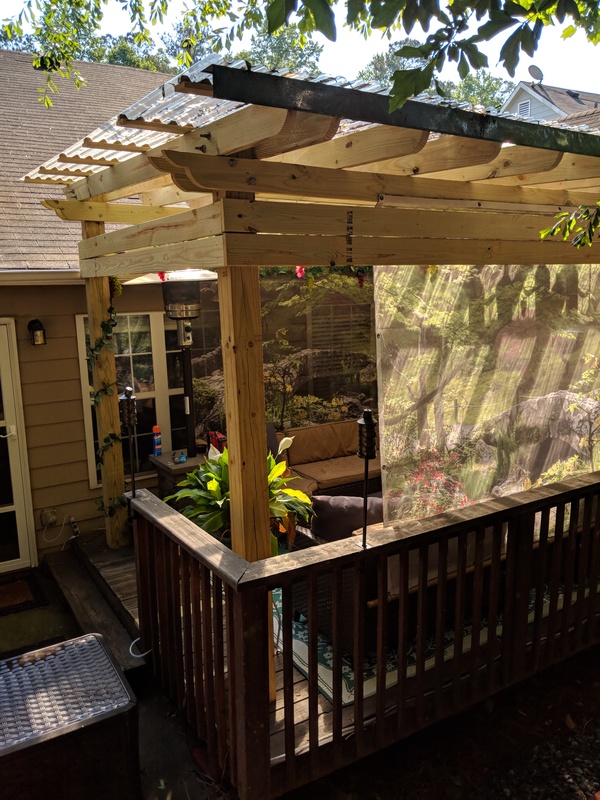 Let’s break down everything from prepping the area to what kind of upkeep you can expect with this beautiful addition to your outdoor space. 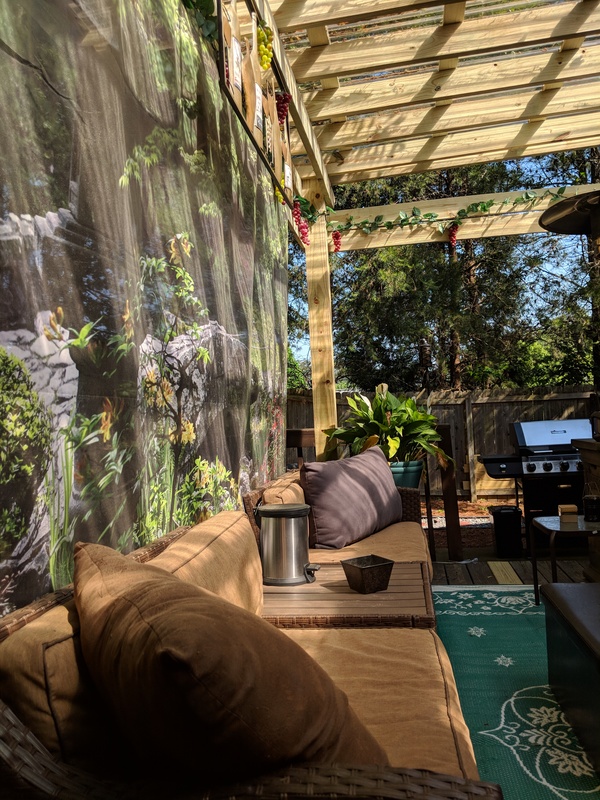 One of the wonderful aspects of pergolas is the abundant variations in design; a simple online peek at Google or Pinterest offers plenty of options to consider, and, of course, the 2HIRE.US team is here to help narrow it down and find the ideal choice for your home. 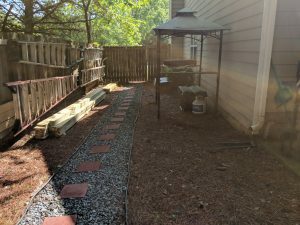 While Keith and his wife chose to fill the dimensions of their 12’ by 16’ deck (conveniently making their pergola a freestanding structure, requiring nothing more than additional footers under the existing deck and then confirming it was level), 2HIRE.US has had excellent success with pergolas reaching as high as two stories! Not only are there plenty of design options to consider, this project can utilize a wonderfully flexible array of materials, from aluminum or steel to pressure treated lumber and more! The Kelchner family, loving the pleasant sophistication of natural wood and its color, chose to use pressure treated lumber and clear corrugated polycarbonate plastic roofing panels to let in the natural light. 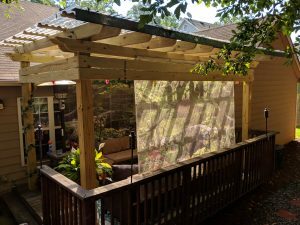 In fact, once completed, pergolas require upkeep so simple and easy it hardly qualifies as mentionable. 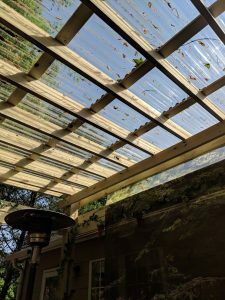 Occasionally blow an errant leaf or two off the roof, apply a coat of stain in the color of your preference (or clear sealant) and think no more of it! 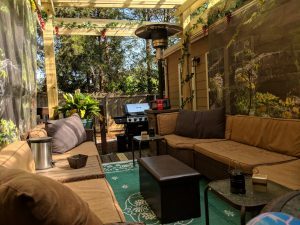 When building a pergola, landscaping is a great option for enhancing charm and lending an elegance to the ambience, just as the décor you choose can tie the entire outdoor space together. Keith and Kat had already planned on redesigning the area prior to construction. 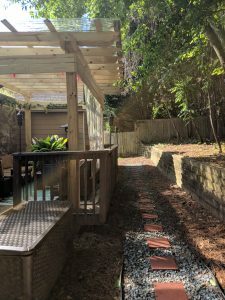 Having only to clear small vines and saplings in preparation, they decided to include a walkway across the backyard, adding a beautiful and agreeable aesthetic to the façade. This was also a practical measure, allowing rainwater to drain between the stones without a muddy yard to step in. Post-construction, finding the right décor for your space is the finishing touch. 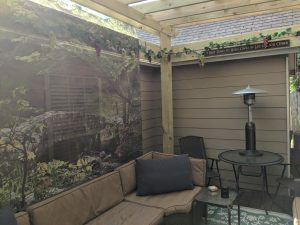 There are myriad options for every taste preference, making it fun and easy to create an enchanting, unique space with your pergola as the lovely centerpiece. Keith and his wife chose to hang outdoor string lights in the trees for a delightful nighttime effect. 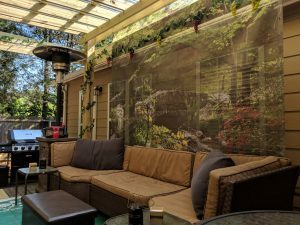 This complements the smaller, clear mini-lights that they wrapped in silk grapevines and easily tacked to wooden boards that attach around the perimeter of the pergola. 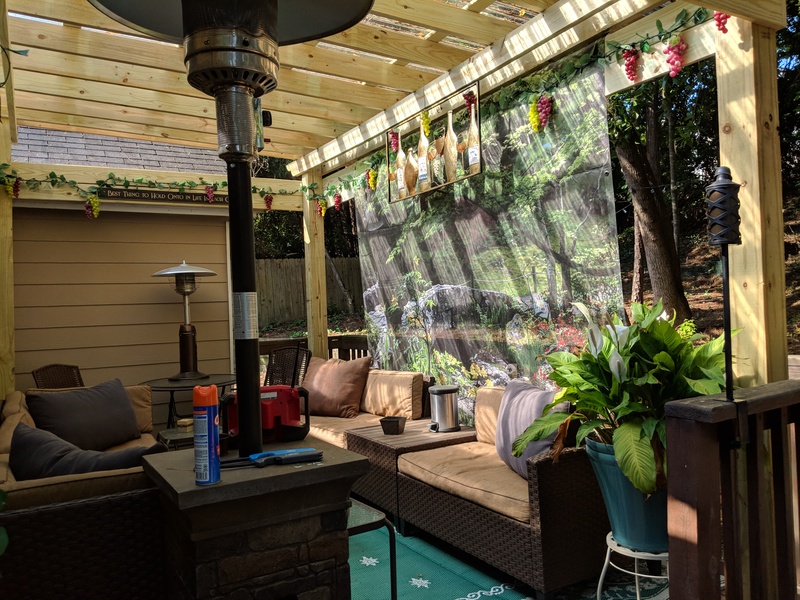 With roll-down screens as a pleasant way to shade those hot afternoons in the Georgia sun, the finished product was exactly what the doctor prescribed for a relaxing evening of grilling out with friends and loved ones. 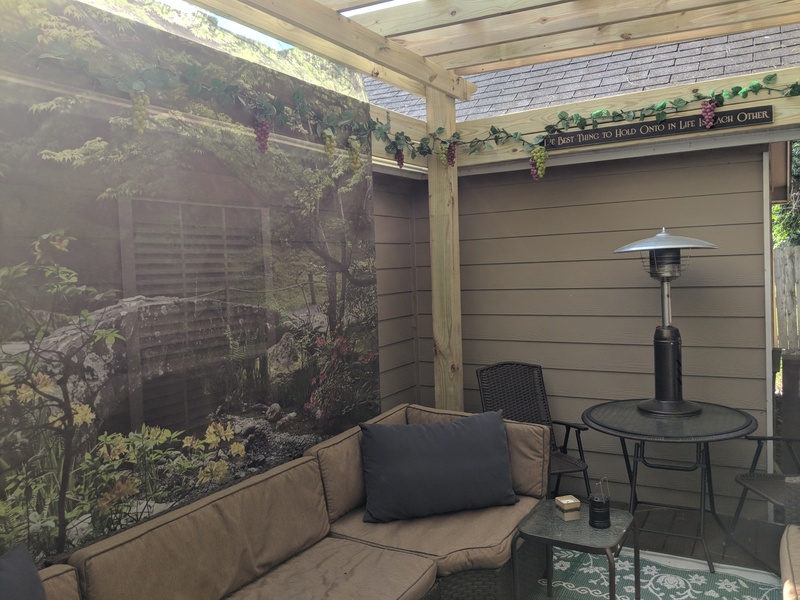 All in all, Keith and Kat Kelchner’s pergola project was both time- and cost-efficient, providing their home additional charm and a space they can enjoy for years to come. 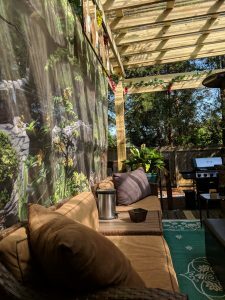 It is the perfect backdrop for everything from backyard barbeques to a relaxing early morning cup of coffee. 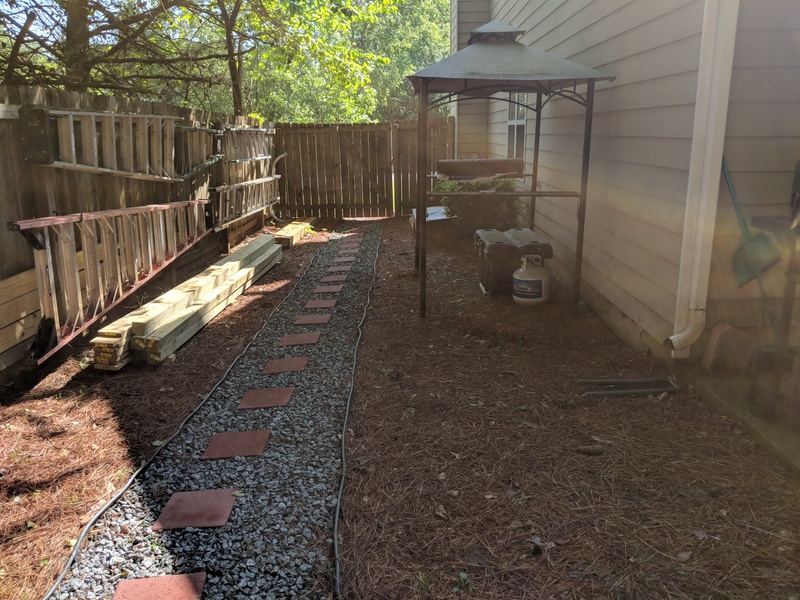 Here at 2HIRE.US, our expert and professional crews use quality materials and bring years of experience to every project! Your satisfaction is extremely important to us and we will strive to honor what you envision for your space. Please continue to follow our blog and explore our website to find additional pictures and videos, testimonials, pricing, discounts, and the many skills we are very pleased to offer; thank you! You can also download our electronic business card to access everything from one convenient place on your smartphone by texting 2HIRE to 36260.